Peru Rail reported that after the 48 hours strike of residents of Machu Picchu town the train service on the route Cusco - Machu Picchu – hydroelectric plant remains suspended until further notice. The suspension applies to all services including the transportation of tourists, local passengers and cargo. For the past two days, citizens of Machu Picchu town protested against the Chilean railway company PeruRail and the Peruvian Ministry of Culture. They mainly demanded a better service for the local population and a stop on plans for a new visitor center of Machu Picchu further away from town that might dampen the community’s income. The main rail line to and from Machu Picchu were blocked in both directions. 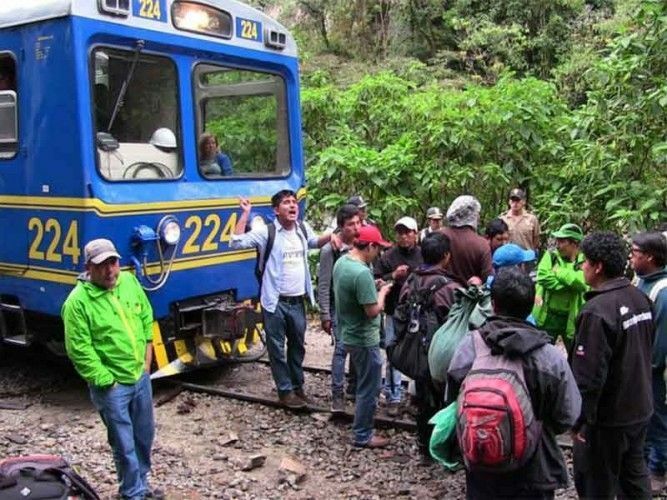 As the strike was expanded indefinitely and protests continue, PeruRail is according to a press release highly concerned about the safety of tourists, local passengers and crew on the Machu Picchu trains. They are working now on improved security measures and assume that they can at least operate some trains later today to get stranded tourists out of the region. Hopefully protesters, PeruRail and Peruvian authorities can come to an agreement, so that the strike and the negative consequences won't damage Peruvian tourism and the image of the country abroad.